The week that went by was quite eventful. We experienced the death and sad loss of our illustrious neighbor Mr Santosh Kumar Gulvady, who passed away quite suddenly at age 72. As usual he went downstairs, after chatting with the neighbors on the same floor, to check the post box. Suffered a cardiac arrest and was gone instantly. God rest his soul in peace. He will be missed. He was a wonderful person. The family, naturally is grieving. Sigh. Naturally, it all brings back to me, this time last year, again, when we were scheduled to visit the hospital on Dec 12 to get the tests done to check the status of Mom’s vertebral column, which was on the verge of breaking from acute spinal TB. We had to take her all strapped to the stretcher, because any movement could not be risked before the doctor gave the go ahead. And oh, after we went to the hospital and the results came out – I’ll never forget the joy on Dr Raghu Hiremagalur’s face – beaming at us – waiting to tell us about the miracle that had happened. Yes, it seemed like there was a God, after all. He couldn’t believe that she could have healed so perfectly – and managed to avoid surgery altogether! When the neurosurgeon clinically examined her, he too was amazed. They had expected her to have to wear orthopedic back braces – but now, even that was not necessary. All that remained was to mobilize her, have her wearing the usual lumbar sacral belt for initial support – and help her get on with her life. Yet, there were other plans in store for her. What can I say, it seems like she suddenly passed away without suffering. She was unconscious and on full life support in the hospital for five days before her heart stopped. But she did suffer for four years – going through hospitalizations, TB and various treatments on the doctors’ whim, it seemed. We never actually perceived her as sick, probably because she was always so cheerful. If she felt sad or angry she expressed it and got over it. Of course, we all got mad at each other – but we always had this policy where we’d never go to bed without hugging and making up. Easy, with her. We miss her everyday, and always will. Probably, because there are only 12 months in a year, and there are memories associated with each month, and sometimes several dates for us. We may have the wisdom to come to terms with all this and move on – but memories will always stay fresh. Especially the happy ones, which are unlimited. Sometimes, it is rather nice to enjoy nostalgia as a temporarily-permanent state of mind. 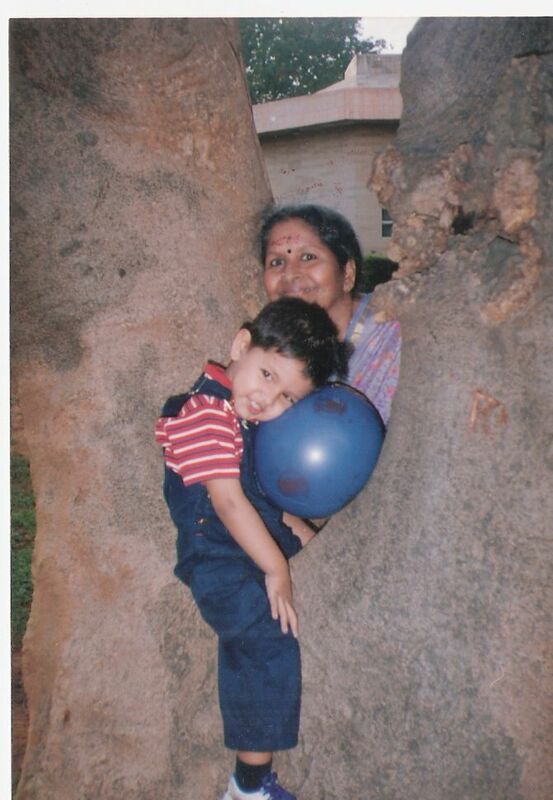 Here’s Mom, and Vidur – from one of their jaunty outings – he must have been about two and a half years old. ” Death is nothing but deprivation of senses, and there is nothing terrible in not living” wrote Somerset Maughm long ago. Likely Maughm spoke of physical existence alone, as memories of departed ones near and dear sustain particularly of Mom. The pang springs up every now and then even we listen to a song sung by her or close to her heart. I console myself in listening to the songs/kirthans sung by my mom. You are right. What a nice comment! Thanks!